George Graham Reviews Balked Goods' "One of Those Things"
Jam bands have taken a number of forms, from zoned-out guitar noodling to tight, funky grooves, to world-music influence, to virtuosic fusion ensembles who can make some significant music in the context of their improvisations. And while the 1990s seemed to be the heyday of the jam bands, last year saw new releases by the three most significant groups currently on the scene, the String Cheese Incident, Umphrey’s McGee and Moe. Each of those bands have their own distinctive approach to the genre. Another big influence to the scene has been the Dave Matthews Band, though they were not always lumped in with the jam band scene. But their influence can be felt in an impressive new album by a young quintet from Long Island quintet called Baked Goods, whose second CD is called One of Those Things. It’s a relatively short album clocking in at under 40 minutes, but with the web and download sales deconstructing the concept of an album, I suppose that is not so much a factor. But their music does have enough coherence that it still makes the concept of an album viable. 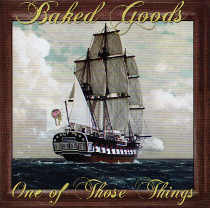 One of Those Things, the new album by the Long Island based band Baked Goods deftly straddles the jam band realm and an almost folky sound. The material has an acoustic guitar at its core but frequently tends toward an infectious funky beat, with good playing all around. The presence of the sax and acoustic guitar may evoke the sound of the Dave Matthews Band, and I don’t think the group would deny some influence there. But they go their own way and come up with a distinctive sound that is appealing, that can serve as party music but also has a lot of interesting musical ideas. With the short length of the CD, the band is not featured stretching out with any extended improvisations, but the material could certainly allow it, and the playing is good enough to support holding their own in a jam band setting. For an audio quality grade, we’ll give the CD a B-plus. The sound is generally clean, especially the vocals, in an era when over-driven distorted vocals seem to be becoming a fad. But as is so often the case, the recording was compressed to make it uniformly loud, which sapped the dynamics of their performance. Baked Goods are an impressive emerging band who managed to create a nice hybrid sound of jam, funk, rock and even folk influence and the potential to be quite appealing to audiences spanning a couple of generations..